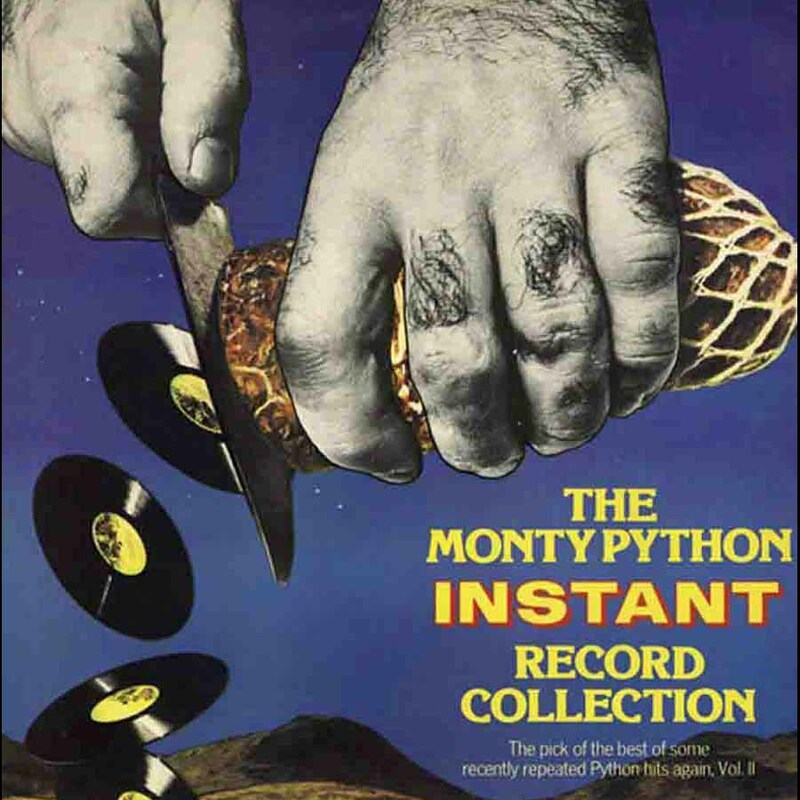 "The Monty Python Instant Record Collection: The Pick of the Best of Some Recently Repeated Python Hits Again, Vol. II"
The original sleeve of this compilation album, designed by Terry Gilliam, folded out into a 12-inch cube mimicking a stack of records - a true "box set." Among the record albums in the stack: "My Brain Hurts" by the Moron Tabernacle Choir; "The Dave Clark Five's War Speeches"; "My Way or Else" by Frank Sinatra; and "I've Got a Beer Glass Sticking In My Head and Other Rugby Songs." A different track listing was used for Arista Records' U.S. release in 1981. The offending word was snipped from the original broadcast version of the sketch, and so until the sketch was restored for BBC repeats and certain home video releases, this album was the only way to hear the sketch in its unexpurgated form. A leftover from "Monty Python’s Previous Record" (although the album confusingly includes a credit for “Proust Song”), it remains a rogue track in the Pythons’ discography since the album was deleted. It’s thought that the sketch was omitted from the album after it was premiered to a less than amused audience at the Great Western Festival, where Python debuted the sketch to a live audience several months prior to their third series appearing on BBC 1. The album also included a new spoken introduction for "Alistair Cooke Being Attacked By A Duck", but as it’s nothing to write home about, we’re writing about it here instead.